Last week's question was about a hat, so I thought we'd take the next step: from hat to crown. That sure is an impressive crown worn by this young king, and he has a spectacular scepter to match! But our question isn't about his crown or scepter. It's about this king's commands. This young king declares that a specific activity should start. The wild rumpus will start! 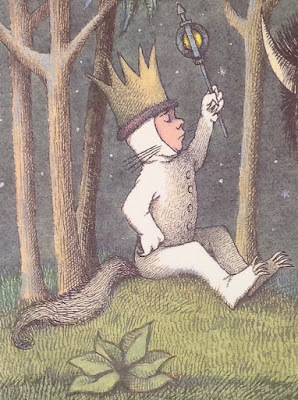 Let the wild rumpus begin.